ScrapeBox is one of the most powerful SEO tools around. You can use it to scrape websites like Craigslist if you use proxies, comment on blogs, check links, and more. While the tool typically runs like a well-oiled machine, you might run across some problems from time to time, especially when dealing with the harvesters. First, let’s take a look at the various harvesters you will use when working with ScrapeBox. Then, let’s look at some troubleshooting tips you can follow if you have issues. These tips should help you get back on track so you can get the most out of this powerful tool. 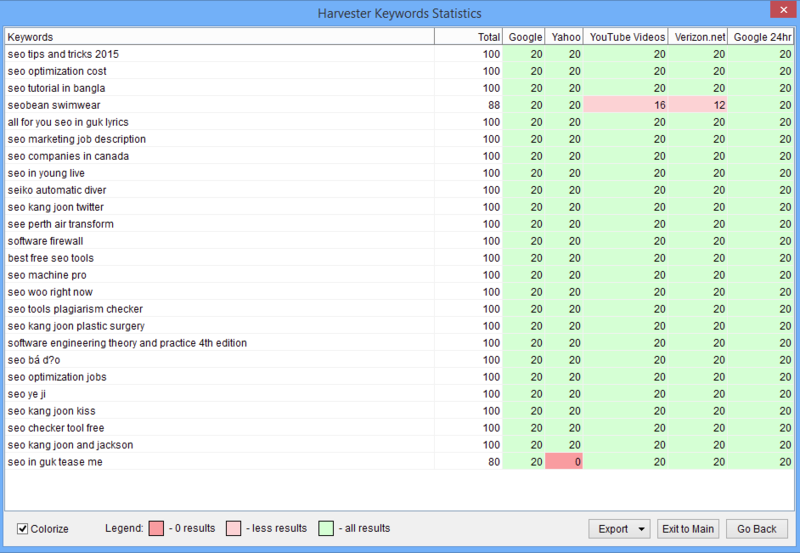 If you’re serious about internet marketing, you need to use ScrapeBox’s keyword harvester. This is an incredibly powerful tool. Just give it one or two keywords, and it will start scraping the internet. It will search the internet for thousands of related keywords and then build long-tail keywords for you to use. Once you get the keywords, you can pop them into your marketing materials and enjoy the results. Long-tail keywords are essential if you’re going to rank in the search engines. These keywords are at least three words long and are laser targeted. When you use long-tail keywords, you are able to reach people who are ready to take action. That means you will get people who are ready to sign up or take their wallets out and make a purchase. That will help you boost your conversation rates and maximize your ROI. The keyword harvester doesn’t just come up with long-tail keywords, either. It finds keywords based on what people are actually searching for. That makes it easy for you to attract people online. You will get a jump on the competition by using the keywords that people are actively typing into the search engines. Now let’s look at the next harvester. If you think the keyword harvester is powerful, just wait until you learn about the search engine harvester. This powerful tool harvests thousands of URLs from more than 30 search engines. The search engines include all of the key players, such as Google and Bing, along with some lesser-known search engines. This gives you the full picture when it comes to analyzing data. It harvests the URLs based on the keywords you select. Then, you can find out which of your keywords produce which results. You can also get a lot of additional information, including key statistics on high PageRank sites. ScrapeBox also lets you filter your results so you can find exactly what you’re looking for with the harvester. Take your time analyzing the data and then put it to good use. It can help you climb up in the search rankings and reach lots of people. Let’s look at the final harvester. You probably won’t use the final harvester, but it is still worth exploring. It is a proxy harvester that allows you to search the internet looking for proxies. ScrapeBox proxies are essential since the tool makes lots of requests as once. If you fail to use a proxy, the search engines will shut you down. However, the proxy harvester searches for free proxies instead of powerful dedicated proxies. That is why you should avoid this tool and buy ScrapeBox proxies instead. If you decide to go move forward with free proxies anyway, the tool will use its 22 proxy sources to find proxies for you. You can add your own sources as well if you would like. It extracts proxies from websites and removes any duplicates. Then, you will need to authenticate the proxies. Those that aren’t authenticated will come up as failed. You can use the tool as-is or you can train it to scrape proxies in a certain way. Training it does give you some control when it searches for proxies. Still, you are much better off going with paid proxies. ScrapeBox is a powerful tool that uses a bunch of resources. Failing to use a dedicated proxy could set you back when using this SEO tool. It won’t be able to harvest your results as quickly with a free proxy, and you will likely deal with a lot of additional issues. It just isn’t worth it. Now that you know which harvesters you can use, it’s time to go over some troubleshooting tips. These tips will help you keep your harvesters up and running. One of the most common problems has to do with the harvester not pulling any data. You input all of the information and put it to work, but it doesn’t come back with any results. This can leave you scratching your head, but it is usually caused by one of two problems. First, you might have an error code. If ScrapeBox encounters an error, it won’t be able to do any harvesting. Second, there might not be any results to pull. It might seem hard to believe that a big scraper wouldn’t come back with any results, but it happens from time to time. Sometimes, you will choose a keyword that simply doesn’t have any results. When that is the case, you will have to change your search string to get results. Determining if it is one of these issues is really simple. Head over to the scraper’s settings menu and look for “use multi-threaded harvester.” Uncheck the box next to that and run the harvester once again. Then, you can look through each query. It will include the keyword, proxy, and the result. You will see one of two possible messages. First, you will see “Results 0 Completed” and then the proxy name. That means that it ran the query but it didn’t come up with any results. You need to use a new keyword to get some results. Second, it might say “Results 0 Error.” Then it will have an error code and the proxy information. You will need to look at the specific error message to find out what the problem is. You can find all of the error codes inside the help menu. Just go to Help and then select “Server Error Code Reference.” Find your error code and the associated message. This will help you determine what you need to do next. Before you do that, though, see if you have one of the common error codes. There are three error codes that are more common than the others. Let’s take a look. First, there is Error 302. This means that your IP is blocked. This might happen if you fail to use ScrapeBox proxies. The search engines will notice that the same IP address is making one request after another, so it will block it. You can fix this problem by adding some proxies into the mix. Then, deploy the harvester once again. That should fix the problem. The harvester should bring back results the next time you run it. Just make sure you use multiple proxies so you don’t run into this issue again. If you only use one proxy, that IP address will end up getting blocked, as well. Error 404 means that the proxy was never found or it is bad. This might happen if you use free proxies, even if the proxies were checked by the harvester. Free proxies can work one minute and go down the next, so you are much better off picking up some dedicated proxies. If you have this error code, switch your proxies out with dedicated proxies and watch the harvester get down to business. Everything should go smoothly once you start using dedicated proxies. Error 407 means that your proxy requires authentication. If you are unsure about the authentication you need to provide, contact your proxy provider. Your provider will give you the information you need. Then, you will need to add the authentication information into ScrapeBox. That will allow it to authenticate your proxies and get to work. You’ve checked for an error code, and either there wasn’t one or the quick fix didn’t work. Now, you are really frustrated. You want to use the harvester, but it is beginning to look like it isn’t going to happen. Don’t give up just yet. There are some simple solutions that might do the trick. Try each of these to see if you can get your harvester up and running again. Advanced technology might be complex, but it can often fix itself with a simple restart. Restart your computer and try to run the harvester again. In many cases, that will fix the problem. This is the best-case scenario. It is always great when you can get up and running after a simple restart. If you’ve used ScrapeBox for a while, you might not have the current version of the software. That can create a wealth of issues for the harvester. Update your software and see if that fixes the issue. In many cases, it will start running like new as soon as it is updated. If it doesn’t, you still have some troubleshooting options to try. This isn’t the most thrilling option, but it does work in some cases. You might have an issue inside of the software, and the only way to fix it is to remove it and reinstall it. Yes, it does take a while to reinstall it, but it might fix the issue. Give it a try to see if it fixes the problems you’re having with your harvester. Don’t you hate it when you’re trying to get something to work and someone asks you if it is plugged in? Of course, it’s plugged in! Only…oops, no, you did forget to plug it in. Simple human error causes a lot of problems, and that might be the case with your ScrapeBox issues. Go back through and check all of your settings. If you have a setting that is wrong, it can make it impossible for ScrapeBox to bring back the results you need. You might feel like an idiot if you realize this is the problem, but just fix it and go about your day. It will make a funny story someday. Even if you don’t get to the point of laughing about it, at least your harvester will be up and running. If you have a problem with ScrapeBox, there is a good chance that you aren’t alone. Tech geeks find and solve problems so you don’t have to go through the headache. Many of them post videos on YouTube. Check out various troubleshooting videos, including the one below. The videos will take you through various troubleshooting methods step by step, making it easy to get your harvester to work once again. If the harvester is bringing back 404 errors or your connections are timing out, you might have an issue with your proxies. Contact your provider to reboot your proxies. Once you get some fresh proxies, you might be able to get the data you need. If you have tried everything else and you still can’t get ScrapeBox to work, it is time to contact the support team. The team will walk you through everything and help you figure out what the problem is. Just send in an email and wait to hear back. The support team is on duty 24 hours a day, so you shouldn’t have to wait long. Then, when you hear back, you can finally get to the root of the problem and start using your harvester. Go through these troubleshooting tips so you can start harvesting today. The sooner you can get back to harvesting, the sooner you will get the data you need. Then, you can use it for your internet marketing campaigns. You will have more data than ever before, so it will be much easier to take on the competition.